The lancelets, or Cephalochordata, are a group of primitive chordates which were formerly called Amphioxus. Lancelets are the modern survivors of an ancient chordate lineage, with a fossil record dating back to the Cambrian period. The lancelets are usually said to be the sister group of the craniates. They are a small group of about 30 species in two genera. Lancelets are usually found buried in sand in shallow parts of temperate or tropical seas. In Asia, they are harvested commercially as food for humans and domesticated animals. They are an important object of study in zoology as they give indications about the origin of vertebrates. Lancelets serve as an intriguing comparison point for tracing how vertebrates have evolved and adapted. Although lancelets split from vertebrates more than 520 million years ago, their genomes hold clues about evolution, particularly how vertebrates have employed old genes for new functions. They are regarded as similar to the archetypal vertebrate form. 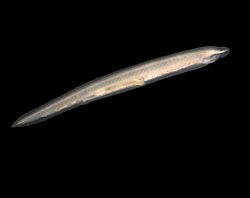 The genome of the Florida lancelet (Branchiostoma floridae) has been sequenced. "Most authors regard amphioxus as the closest relative of the Vertebrata on the basis of 10–15 [morphological] features that are not seen in tunicates". The lancelet is a small, translucent, fish-like animal that is the closest living invertebrate relative of the vertebrates. Lancelet Facts for Kids. Kiddle Encyclopedia.